I made this Pink Ombre Stripes Heart Chiffon Cake for my dear friend who wanted to give her fiancée an early Valentine’s day surprise, as they are getting married next week on Valentine’s day! I am so happy for them! I hope that this Valentine’s day gift will be a very special memory for them. The two hearts interlocking design was also specially designed for the love birds. 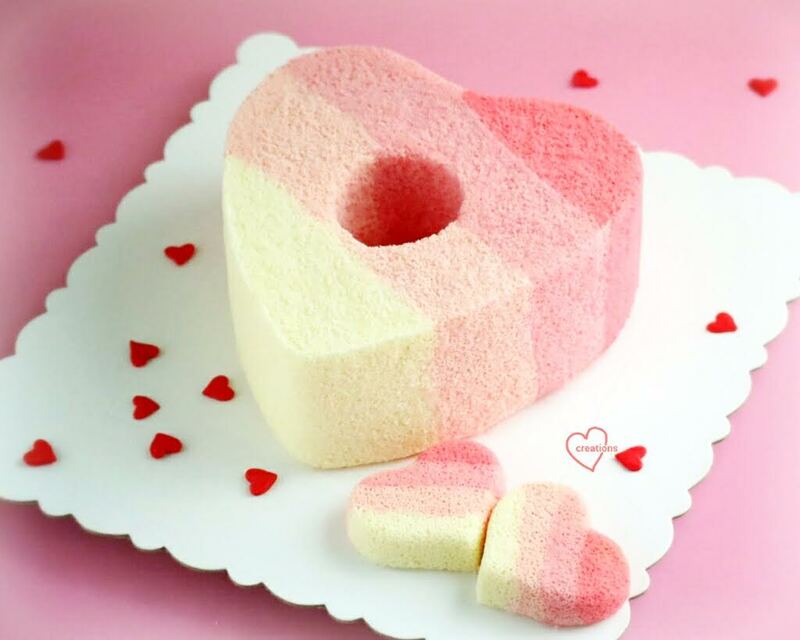 The chiffon cake is dual-flavoured, starting from vanilla (cream-colour) and ending with strawberry on the other end (pink-red). I used the tube hole to hide some sweets in the cake for a hidden surprise! Thank God the cake was very well-received! 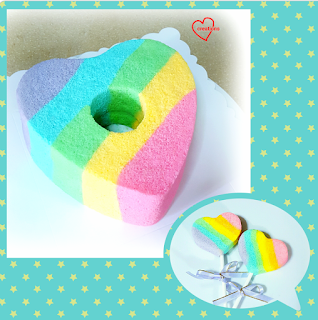 I’ve previously made a Rainbow tiedye hearts chiffon cake (rainbow version of cake), and it's now in my second chiffon cookbook, Deco Chiffon Cakes. I used a heart chiffon tube pan I got from TSB (The Story Begins). It's so pretty isn't it? 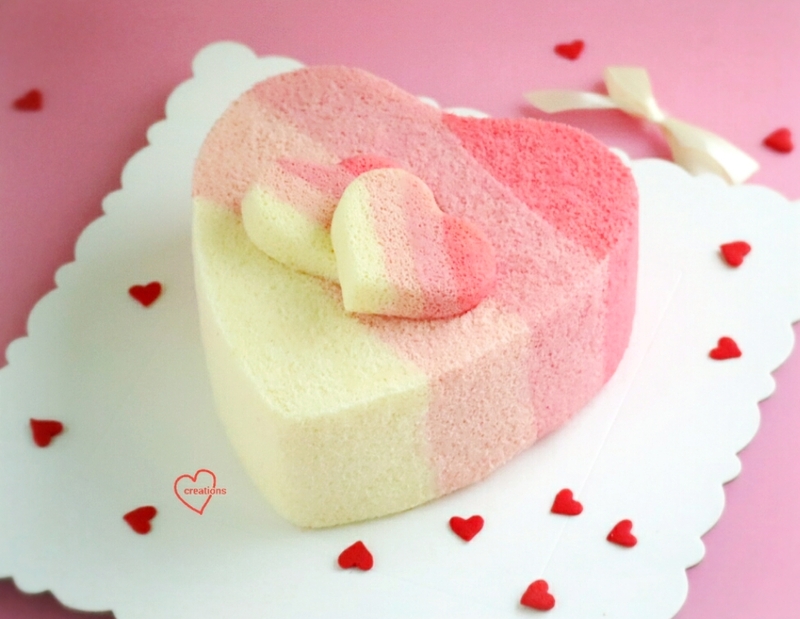 The chiffon cake pan I used is 17-cm heart Cakeland pan. It can also be found on rakuten. 1. Preheat oven to 160°C. Prepare a tray of water under the lowest rack for steambaking. *Optional but helps to increase moisture for ogura-like texture. 3. Add in sieved flour and whisk till no trace of flour found. Divide the batter into 4 parts. Leave the first portion plain. To the red portion, add ½ tsp strawberry paste. To the other two pink portions, I added a dip of strawberry paste and used drops of red food coloring to adjust the shade of pink to in between cream and red. *I used PME natural red coloring but you can also use wilton and other types of food coloring. 5. Divide the meringue into 4. Gently but quickly fold in the meringue into the 4 colours batter. You need to work very fast for the meringue not to deflate. 6. Scoop the cream batter using a small teaspoon into bottom right of the base of the chiffon tin. Then repeat with light pink, dark pink, and red batters respectively, diagonally across the tin, to the opposite top left of the base. Repeat another 3 times above the layer till batter is 2 cm from the top of the tin. Gently tap the tin on the counter lightly to remove air bubbles (but do not overdo it). 7. Bake the chiffon cake for 15 min at 160°C and then 140°C for 30 min. 8. Invert the chiffon cake once removed from oven. I had leftover batter which I used to make 3-4 smaller heart chiffon pops similarly using a silicone hearts mould. Baking time as follows: 10 min at 160°C and then 140°C for 10 min. 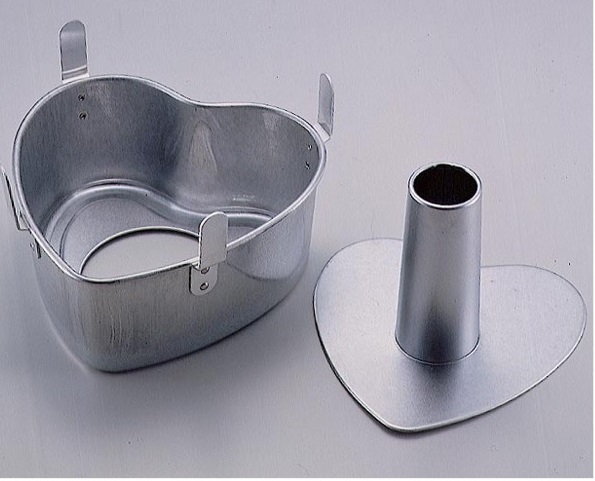 *Silicone needs lower temperature as it browns more easily than the tins. 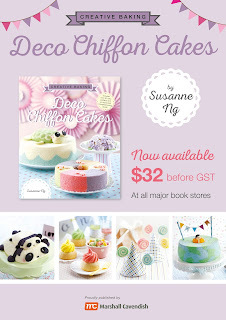 Step-by-step picture tutorials of how to pattern the batter diagonally in can be found in Deco Chiffon Cakes. Have a sweet week ahead! Happy Valentines’ day in advance! won't the (1st strip) batter spread out before you get to the 2nd strip? Lovely cake dear! Can I the link where I could buy the tube pan online? Thanks for your help! Hi, may I know the reason of reduce the egg yolks in the recipe? As thinking it is too waste for the yolks and not sure what to do with the yolks. Thanks.